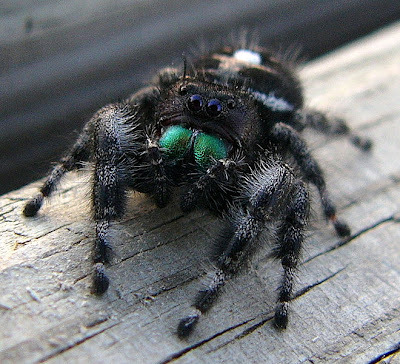 I wonder what this jumping spider is thinking... Maybe that he wishes he had a costume on EcoBuddies- lol! Let's tell Jumbles to make one, ok? Did you know jumping spiders do not make webs to catch their prey, but run and jump after them. A spider like this will jump and bite its prey in the air- wow! These spiders can jump 20-80 times the length of their bodies! I really like these spiders because they are soooo cool looking. They have SUCH hairy legs! These hairs help them to climb tons of different terrains. For example, some of these spiders live even on the tallest mountain in the world, Mount Everest. Can you believe it? Also, like the coolest thing about these spiders are that they are very curious creatures. Instead of hiding or playing dead when they see a human, they get excited and will jump toward the human and even sometimes jump on a person's hand to take a closer look. Hilarious, hey? What are your favorite spiders? Let me know and I will post a picture of them!